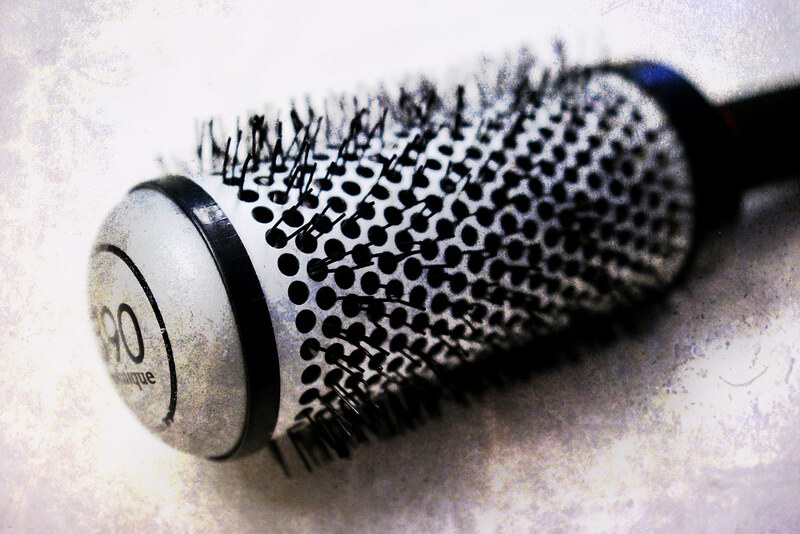 My styling brush -I added a texture to make it look "tainted"
The kids decided it would be "fun" to put some "stuff" on the hairbrush I use to blow dry my hair with. They sprayed some Tag [you know - that body spray for men] on it, then glopped on some Dep gel and finally added a bit of shaving cream. The culprits spread on the gel and shaving cream in a way that I couldn't ascertain there was anything "wrong" with my brush. Until I used it to dry / curl my hair. Which brought out all the scents of the gel, Tag and shaving cream. Then the heat of the hairdryer (I use the hottest setting) reacted with all that "stuff" to form what can only be described as a toxic burnt offgas. Something the EPA would have a problem with. Of course, the smell lingered in my hair all day long. Eww and double Eww. I took action by cleaning the brush. No more residue. All is well again (until the kids get into something else).